Nar phu valley trekking is opened to the tourist only in 2003 this trek takes you to the remote Nar phu valley inhabited by Nepalese Tibetans. Nar Phu the population about 300 inhabitants who depend on livestock, unlike most Bhotia people, whose trading patterns changed drastically after the Nepali Government closed borders with Tibet, the people of Nar and Phu valley were least affected by this change. Path leading from the Narphu valley into Tibet had never made them dependent on the salt trade and till today yak herding is the basis of their livelihood. Visited by very few trekkers this exotic land offers medieval Tibetan culture in undisturbed form, dramatic mountain views and great alpine scenery. Nar Phu valley trek starting point is Besi Sahar following the popular Annapurna circuit trail and branch off at Koto to follow the off the beaten track to Nar Phu valley in the north of Manang (Trans Himalayan zone). 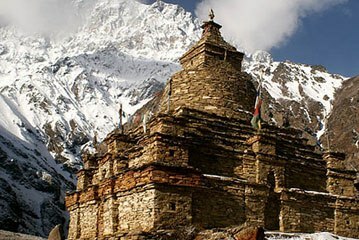 Price includes: Airport Pick up/drop, 3 nights accommodation in kathmandu & 2 nights in Pokhara at tourist standard hotel, sightseeing in around kathmandu valley by private vehicle and a professional city guide, all inclusive trek such as Ground transportation, necessary permits entrance fees, professional guide, porter/porters, and their expenses including their insurance and equipments, accommodation at lodges en route, all food (breakfast, lunch & dinner) with tea/coffee, etc.